SANTA BARBARA – The Santa Barbara Channel Challenge/Ventura Cup took place last month with individuals and teams sailing in two windward-leeward races and an offshore random leg race. 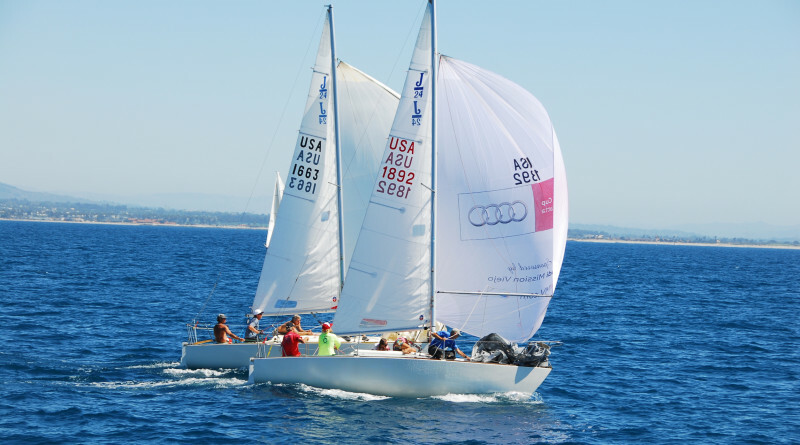 Ventura Yacht Club’s Team Gold retained the Cup, but not without a strong attempt by Ventura YC’s Team Blue to dethrone the defending champs. Representative from Santa Barbara Yacht Club indicated they plan to come back next year and reclaim the Cup they held for several years. Class A: 1–Rival, J-35, Dave Boatner (2-1-1); 2–E Ticket, Santa Cruz 37, Tom Hudson (1-2-3); 3-Troublemaker, Shock 35, Rod Abbott (3-4-2); 4–XS, Mull 30, Geno Beville (6-3-4); 5–Superlumjinal, FT 10, Jerzy Poprowski (4-5-5). Class C: 1–Jaded, J-24, Deke Klatt (1-1-1); 2–Disheveled Rogue, J-24, Garrett Baum (3-2-2); 3–Tortoise, J-24, Suzi Ramey (2-4-4); 4–Within Reach, J-24, Claudia Gottstein (4-3-5); 5–Out Patient, Cal 29, Randy Alcorn (5-5-3). 1—VYC Team Gold 15 (Rival 2-1-1, Pangea 2-2-4, Jaded 1-1-1); 2–VYC Team Blue 17 (Asylum 1-1-3, Disheveled Rogue 3-2-2, USA 3324, 2-1-2); 3–VYC Team 1 28 (Troublemaker 3-4-2, E Ticket 1-2-3, XS, 6-3-4); 4–VYC Team Red (Fat Tuesday 3-3-6, Tortoise 2-4-4, Eclipse 3-2-3); 5–CIYC 32 (Fusee 4-4-4, Maverick 6-5-2, Velero 3-3-1); AYC Team 2, 48 (Superluminal 4-5-5, Alcyone 7-7-7, Out Patient (5-5-3). VENTURA — The Ventura Sailing Club’s Prison Break started on Sept. 12 with the arrival of the eight participating boats into Prisoner’s Harbor on Santa Cruz Island throughout the day.